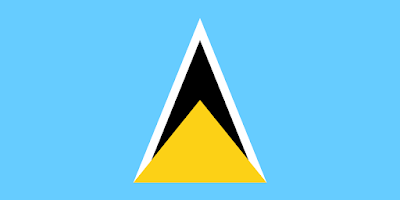 This Week In Vexillology, we're still kicking around the Caribbean Sea moving north from Trinidad and Tobago to take a look at the flag of Saint Lucia. (Which, yeah, bears a passing resemblance to the Delta-Symbol from Star Trek- at least a little bit, anyway.) Settled in 1635 by the French, Saint Lucia got passed back and forth between the British and the French multiple times over the centuries until the Treaty of Paris in 1815, which saw Britain take final, permanent control of the island- it became a crown colony of the United Kingdom that year. It joined the West Indies Federation from 1958-1962* and when that didn't work out, it became an associated state of the United Kingdom and adopted it's currently flag which it retained after independence in 1979. Glancing through it's Wikipedia page- which I know is a terrible way to get to know a country, but cut me a break, all right? It seems like Saint Lucia is your typical tropical island paradise: beaches, great weather, plenty of tourism, etc, etc, etc. Remember, until next time keep your flags flying- FREAK or otherwise!